Circle-up for dinner around the table, then move into the living room for a fierce round of Outburst. It's at its best in the summer and fall, but who knows, you may get lucky earlier in the year. Part-indoor, part-outdoor - this pool has it all. A kitchen this well equipped makes you extremely glad you decided not to camp. 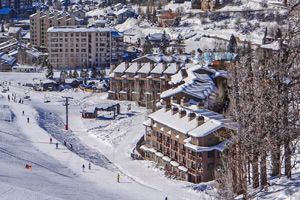 Steamboat Ski Resort is an easy 9 minute walk from the resort – map out your plan on the way there. Go for a swim in the heated outdoor pool or just kick back and enjoy the view of the mountains. There are 2 outdoor hot tubs at the resort – try them both and pick your favorite. Gather your kids and head out to Spring Creek Trail, 10 minutes drive from the resort. Don't forget the water bottles. Work on perfecting your swing at Rollingstone Ranch Golf Course, 5 minutes drive away. Truth be told, it doesn’t get any more convenient than Gondola Square, and that’s right where you’ll find the French-named Chateaux Chamonix. A ski-in/ski-out resort, it’s nestled at the base of Mount Werner, and in keeping with the French theme, offers a welcome bottle of wine. (There’s complimentary coffee, hot cocoa and doughnuts each morning at the front desk – if you forget, the kids will sniff it out – guaranteed.) Complimentary on-slope ski valet service and storage means your gear magically appears with a wave of your claim ticket. When you return from the mountain, all pink-cheeked and snow-dusted, trade all those layers for a swimsuit and warm up in the indoor/outdoor heated pool, one of the outdoor hot tubs or the sauna while mentally putting a plan together for dinner. Taco bar? Chili with lots of topping options? Or declare yourself off-duty and catch the winter shuttle to downtown Steamboat. Individually decorated two-, three- and four-bedroom condos give you a full kitchen and more than enough hangout space. Gather around the dining table for breakfast favorites, then regroup over steaming plates of spaghetti and meatballs to relive the day’s best jumps and worst wipeouts (with the GoPro video to prove it). Get the little ones into jammies before you all finally collapse in front of the fire – they may not make it through the whole movie. Toss in some laundry, then escape to the jetted tub in the master bathroom before calling it a night. Here in Steamboat, summer and winter vie for “best season,” and both are such strong contenders there’s no clear winner. (Let’s just call it a tie.) Summer delights with 50 miles of gondola-accessible trails at Steamboat Bike Park, golf at Haymaker, and the chance to see a genuine rodeo. Make your way to the Steamboat Stage in Gondola Square for Movies on the Mountain each Saturday night, or check out the guided gourmet hike up Mount Werner, followed by lunch at Thunderhead Lodge – keep your camera handy for spectacular Yampa Valley views. Here for the Champagne Powder? If you’re still going strong after a day on the slopes, head back to the base for night skiing. The Christie Peak Express high-speed chair whisks you up 8,000 feet, where you can access five lighted trails. Plus you get one night free when you show your boarding pass from the Steamboat/Hayden Airport. Just there for moral support? Order drinks at the Umbrella Bar, find a seat near a gas fireplace on the deck and see if you can spot your crew. Snow tubing more your speed? Try historic Howelsen Hill or the Yee-Haw Tubing Hill at Saddleback Ranch. Longhorn Lodge is there for warming up between runs.